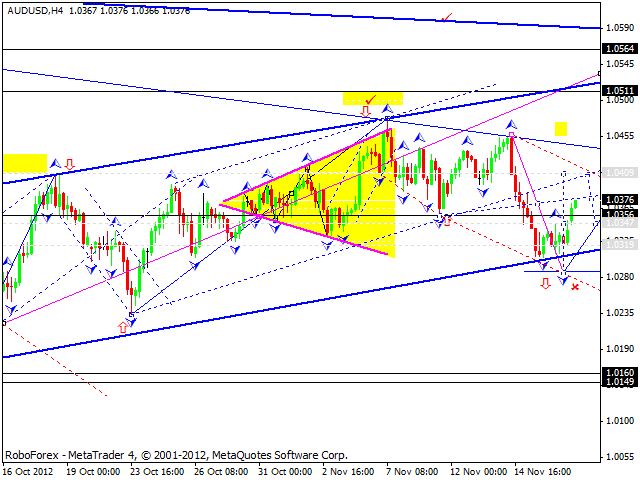 After the market opening the EUR/USD currency pair continued forming the second ascending impulse. The structure of this impulse looks like the continuation of another ascending wave. Today the pair is expected to continue growing up towards the level of 1.2830, fall down and test the level of 1.2760 from above, and the move downwards to reach the level of 1.2720. 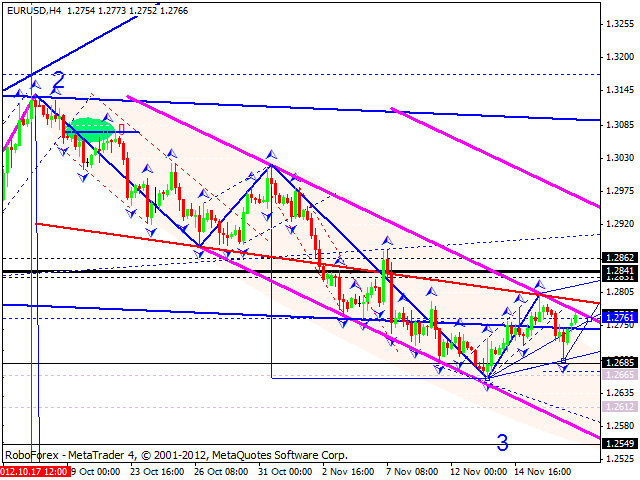 Later the price may form one more ascending structure towards the level of 1.2860. This may be the end of this correction, which will take the form of “Flag” pattern. After that we can expect the descending trend to continue. After the market opening the GBP/USD currency pair continued moving downwards and forming the second impulse with the target at 1.5947. Today the pair is expected to reach this target, return to the level of 1.5890, and then start growing up towards the target at 1.5955. 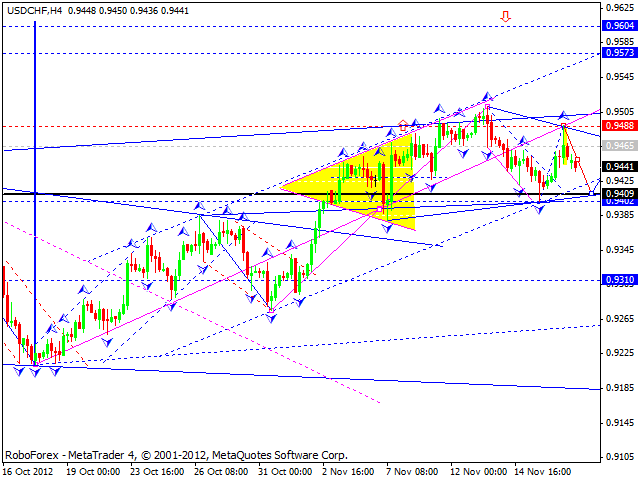 This may be considered as the end of this correction and we can expect the descending trend to continue. 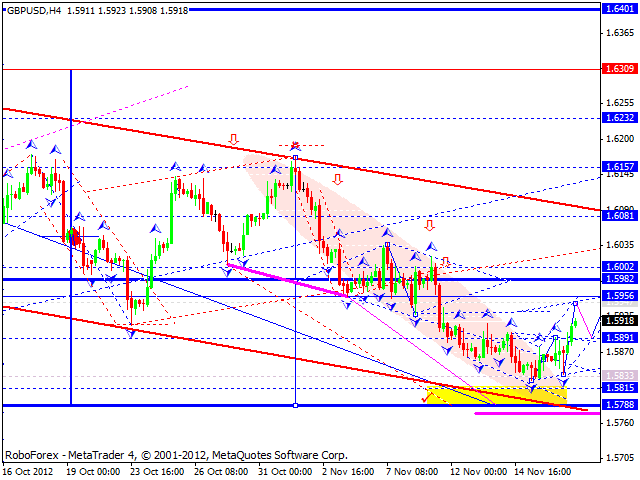 After the market opening the USD/CHF currency pair started moving downwards slowly. Such movement structure implies that the price is unlikely to continue any serious correction. Let’s assume that the market is forming “Triangle” pattern. Today the target is at 0.9410. Later the price mat return to the level of 0.9465. 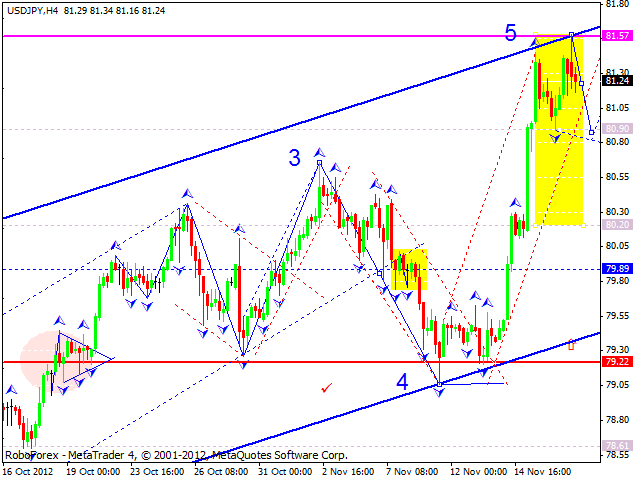 After the market opening the USD/JPY currency pair reached a new top. By doing it, the price completed the last ascending structure and may start a correction. Today the pair is expected to fall down towards the first target at 80.90, return to the level of 81.22, and then start another descending structure inside the correction. The market was opened with a gap up. Today the pair is expected to continue growing up towards the level of 1.0410 and then start moving downwards and eliminate the gap. 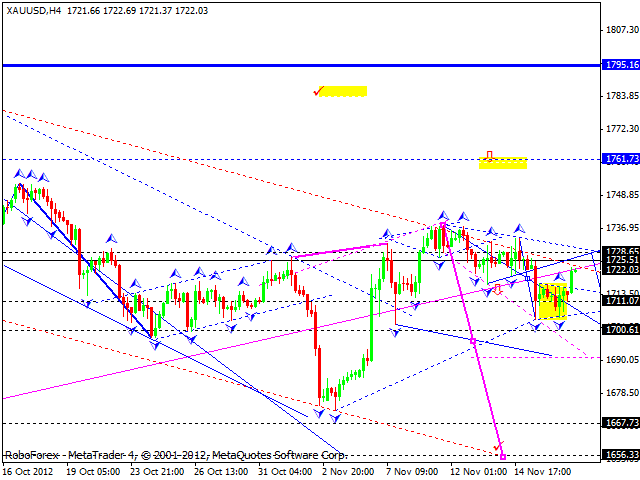 Gold is trying to start a corrective movement towards the previous lows. Today the instrument is expected to grow up towards 1727, move downwards to test the level of 1711 from above, and then form one more ascending structure towards the target at 1730. This may be considered as the end of this correction and we can expect the price to fall down and reach the level of 1700.